Resveratrol is an antioxidant found predominantly in the peel of the grapes, and is a part of the plant’s antibacterial and antifungal defense. Resveratrol is one of the components of red wine which are beneficial to human health. Research has shown that it improves cardiovascular health and affects, among other things, various factors of cellular ageing. Our vision for Wonder Wine is that it should encapsulate a multitude of beneficial attributes, primarily health-related. Recently, advancement has been achieved in creating engineered yeast which contained two foreign enzymes essential to resveratrol biosynthesis. These enzymes, originally found in grapes, are 4CL (P-coumarate-CoA ligase) and RS (Resveratrol Synthase). 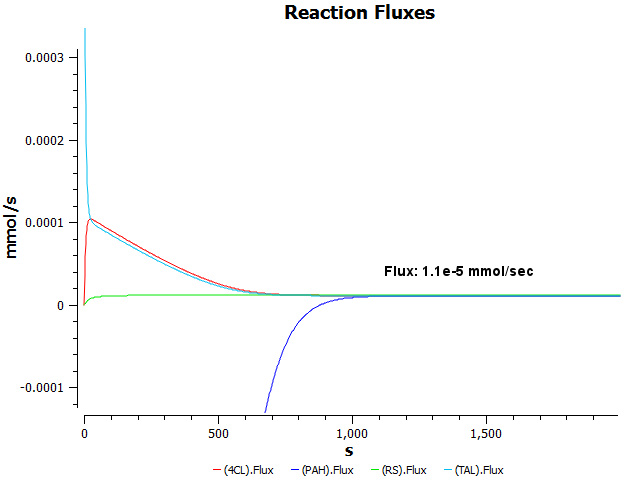 4CL turns p-coumarate into p-coumaroyl-CoA, which is then used by RS to produce resveratrol. Since p-coumarate is not found naturally in yeast, the scientists RS had to add it to the medium in order for resveratrol synthesis to occur. That's where we come in. 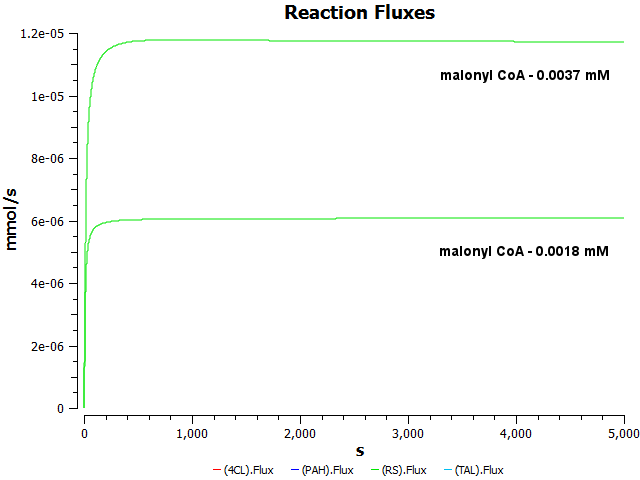 We would like to demonstrate, with the help of a model, how the introduction of a third enzyme from grapes – TAL (Tyrosine-Ammonia-Lyase) can obviate the need to supply p-coumarate externally. TAL can convert L-tyrosine, found naturally in yeast, into p-coumarate, thereby supplying the missing building block for resveratrol biosynthesis, with no need for specialized media. 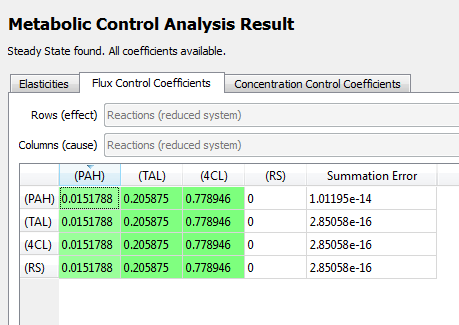 Our model is meant to predict the overall success (or otherwise) of the yeast resveratrol pathway with the addition of TAL (Fig. 1). It was created by using Copasi – a software for the simulation of biochemical networks, which implements MCA – metabolic control analysis. 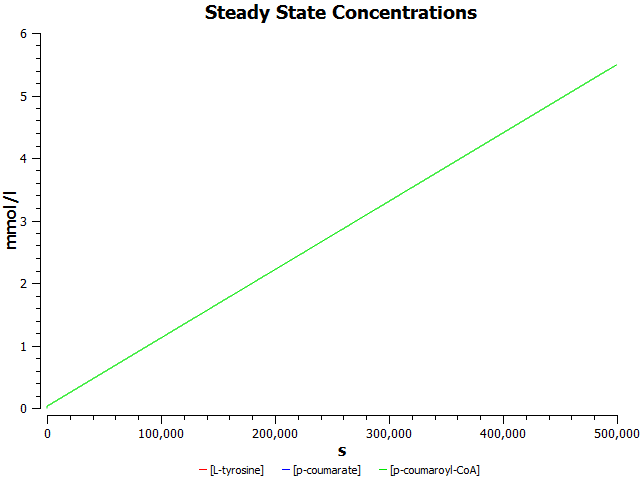 MCA is a comprehensive mathematical framework invented to deal with the response of metabolic pathways, at steady state, to small perturbations in the activity of enzymes and the concentrations of the various metabolites. 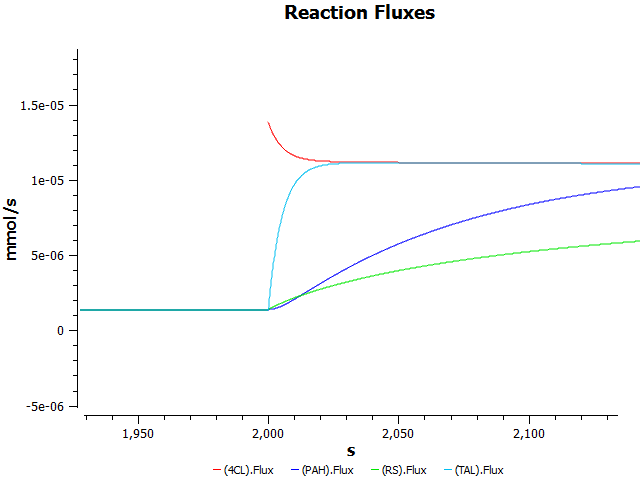 It can calculate the steady-state flux through the pathway, the control coefficients of the participating enzymes and the steady-state concentration of each metabolite. Sun, P., Liang, J.L., Kang, L.Z., Huang, X.Y., Huang, J.J., Ye, Z.W., Guo, L.Q., and Lin, J.F., (2015). Increased resveratrol production in wines using engineered wine strains Saccharomyces cerevisiae EC1118 and relaxed antibiotic or auxotrophic selection. Biotechnol. Prog. 31 (3): 650-655. Hoops S., Sahle S., Gauges R., Lee C., Pahle J., Simus N., Singhal M., Xu L., Mendes P. and Kummer U. (2006). COPASI: a COmplex PAthway SImulator. Bioinformatics 22, 3067-74. Kreuzaler, F. and Hahlbrock, K., (1975). Enzymic synthesis of an aromatic ring from acetate units. 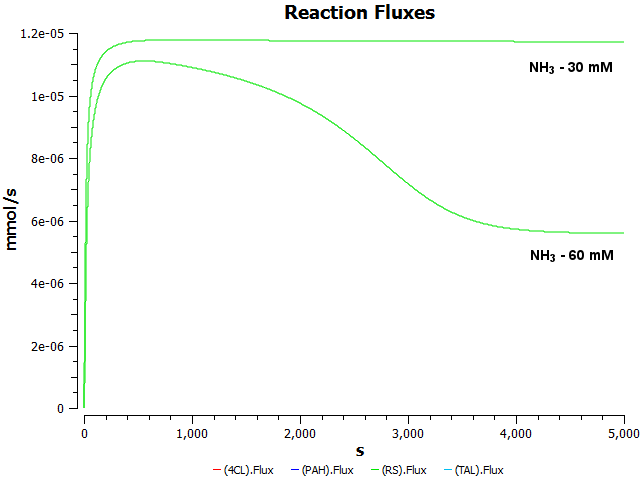 Partial purification and some properties of flavanone synthase from cell-suspension cultures of Petroselinum hortense. European journal of biochemistry. 56 (1): 205-213. Schomburg, I., Chang, A., Hofmann, O., Ebeling, C., Ehrentreich, F., and Schomburg, D., (2002). BRENDA: a resource for enzyme data and metabolic information. Trends Biochem Sci. 27 (1): 54-56.